New Orleans From Jump Street let me concede that I find the current coup and counterrevolution in Egypt confusing and contradictory. The hope of the Arab Spring has eroded over the last two years. The Organizer’s Forum visited Cairo then, and as exhilarating as many of the meetings were, we could already feel the people’s revolution slipping away during the campaign for the first freely elected president. Thanks to the much better organized Muslim Brotherhood and its national presence, their candidate Morsi took office, but his unbending style polarized the country even more, laying the ground for the military coup to push him out of office and more recently to brutally suppress demonstrations against their action with blood. Though much of this has been cast as a fight between secularists and religionists for control of the heart and soul of the country, the actions around unions indicate that they are also in the crossfire of the military, despite in some cases their support for the coup. The largely unwritten story we found in Cairo was the critical role of labor in pushing Mubarak out and supporting the actions in the square with widespread strikes and work stoppages largely led by independent unions and workers in defiance of the state approved labor structure. After the fall of Mubarak there was widespread dissatisfaction that the military supported pre-election puppet government was continuing to maintain the unrepresented and corrupt labor status quo. The new constitution developed by Morsi and his Muslim Brotherhood affiliated majority did nothing to assuage the concerns of activists and labor leaders hoping to build and replace the labor apparatus with an independent and autonomous worker centered structure. 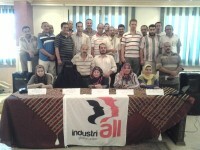 Perhaps the most outstanding group we met in Egypt was the leaders of the Center for Trade Union and Worker Services. In fact the Center’s primary leader was even arrested by the post-revolution government on bogus charges. Importantly, their first email after the recent military coup was adamant and full-throated support of the military and its eviction of the elected Muslim Brotherhood leadership. News now indicates that the military is targeting leadership of worker led strikes around Cairo and David Kirkpatrick of the New York Times reported that some strike leaders were arrested on the pretext of having beards and therefore accused of instigating the strike which had been over wages and declining living standards, claiming instead that they were tools of the Brotherhood, which was denied by all. In the middle of a mess, this is a worrisome sign for any hopes of the return of democratic prospects or a vibrant labor movement that is so essential in any democratic society. While fearing the worse, another message arrives from the Center for Trade Union and Worker Services critiquing the constitution now being formulated by the military’s caretaker government as containing “steps forward” and “steps backward.” The Center applauds the guarantees in the new formulation of social insurance, an end to child and forced labor, and other provisions, but notes that the right to strike is still not fully protected and that no worker or union representatives are included in the 50-person council that has been appointed to review the latest draft of the constitution. The Center’s applause of only several weeks ago now seems to be one hand clapping. If there is trouble for workers and their organizations in Egypt, as now seems increasingly the case, this is not a situation where, as Secretary of State John Kerry has argued, we need to believe the military that democracy is again on the horizon, nor should conservatives feel comfort that they should swallow this pill now as a pushback against religious extremism, rather than a wider and deeper effort by the military to silence any and all voices and reassert controls over all of the political and economic life of the country, not just the national security. They are coming after the unions, and that means that this counter-revolution will be devastating to Egypt, its people, and therefore the rest of us who value freedom as well. How Can Kamal Abbas be Sentenced to Jail Now in Egypt? New Orleans When the Organizers’ Forum visited Cairo in the fall of 2011 one of the most impressive people we met was Kamal Abbas, the long time director of the Center for Trade Union and Worker Services (CTUWS), based in Cairo. We visited him in his offices and were intrigued and inspired by the accounts of the struggle, hardship, and constant pressure that he and other advocates of an independent, non-state controlled labor movement shared with us. In the aftermath of what so many of us continue to hope still promises a future of revolutionary change I couldn’t believe when I received a message yesterday from Constanza La Mantia, one of our delegation from Palermo, Italy, forwarding to me the fact that Eric Lee and Labour Start in the United Kingdom are preparing to launch a petition drive in protest of Abbas being sentenced to 6 months in jail. Her message this morning and a check on the Internet confirmed that even in the post-Mubarak period the effort to silence genuine voices of dissent and independence continues. One of the clearest lessons we learned in Egypt was that this was not a Facebook revolution, but was a social upheaval triggered in no small part by workers desperate for change and living wages and initiating waves of strikes that the military could not quell. This kind of repression helps underscore that point. To sign the petition click here and then spread the word. 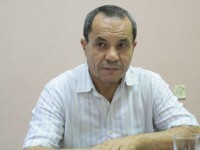 A “misdemeanour court” in Helwan, near Cairo, has sentenced Kamal Abbas, general coordinator of the Centre for Trade Union and Workers’ Services (CTUWS), to six months in prison for “insulting a public officer”.